President Muhammadu Buhari and Benue State Governor, Samuel Ortom today attended the 70th Session of the United Nations General Assembly Side Event hosted by the Government of Nigeria in partnership with the organizations' agencies and the Global Fund. 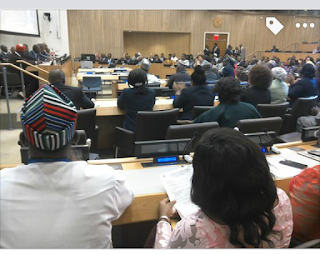 Held at conference room three of the General Assembly building, the event was organized by the National Agency for the Control of Aids, NACA, and Professor John Idoko, Director General of the agency hosted and anchored it. President Buhari delivered an address at the occasion. The event came on the heels of the excitement which Nigerian envoys expressed at Governor Ortom’s amnesty program when he visited them at the Nigeria Building hosting the Permanent Mission of Nigeria at the United Nations in New York. Ambassadors Usman Sarki, Deputy Permanent Representative of Nigeria, Usman Baraya, Permanent Representative of Nigeria to the African Union as well as Dr. Cyprian Heen, Minister Counsellor at the mission said the program excited them as it was the way to go in pursuing global security and peace. The diplomats who spoke separately stressed that the approach coincided with recommendations of the United Nations which preferred local community security, peace and reconciliation efforts. The diplomats said they were glad when they saw reports on the program as well as the joint security and peace meetings between Governor Ortom and his Taraba State Counterpart, Arc Darius Ishaku and urged other governors to also take a cue. In his response the Governor stated that he made the provision of security his priority so as to create an enabling environment for investment in the state that would boost job, wealth and opportunities' creation. 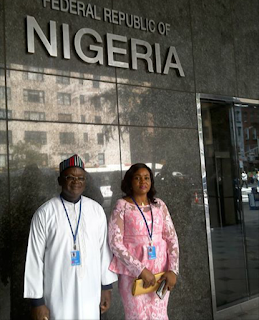 He visited the mission after his accreditation for some of the United Nations Assembly programs slated for the day. His wife Eunice Erdoo Ortom, Special Advisers on International Development and Cooperation, Dr. Magdalyne Dura, her counterpart on Media and ICT, Tahav Agerzua, as well as Dr. Tavershima Adyorough, accompanied him. Mr. Nicholas Ella, an assistant director in the Ministry of Foreign Affairs received Governor Ortom at the Nigeria House.